Last year, I shared a peek inside my makeup bag. Over the past year, I’ve tried out new makeup products, and changed what I’m using based on preference and accessibility. Today, I’m going to share the products currently sitting in my makeup bag/drawer. These are the products I use every single day, except on days when I skip wearing makeup. My makeup routine is simple and works well for me. 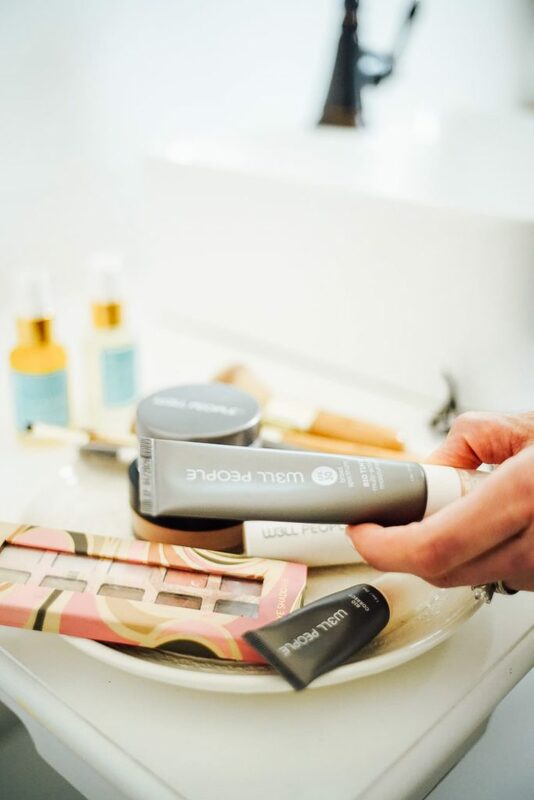 With the products I’m sharing today, I can get ready in under 10 minutes each morning. I call that success. And the products are all made with non-toxic ingredients that I feel confident about applying to my skin. And the best part, besides the products being non-toxic? Many of these products are now found at Target. This post isn’t sponsored by Target, or in anyway affiliated with Target. That said, Target has taken some impressive steps towards non-toxic skincare in the past year. Have you seen the green beauty section at Target? Very, very well done. My favorite brands from Target, as far as makeup and body-care, include: MeowMeow Tweet (great deodorant, although Primal Pit Paste is my go-to brand), W3LL People (a makeup staple in my makeup routine), and Honest Beauty (I’ve heard the mascara is incredible, but it’s always sold out at my store). I don’t purchase every makeup product from Target. Some of my favorite brands can’t be found at Target. For now, I’m thankful that non-toxic, clean beauty options are slowly making their way into mainstream stores. 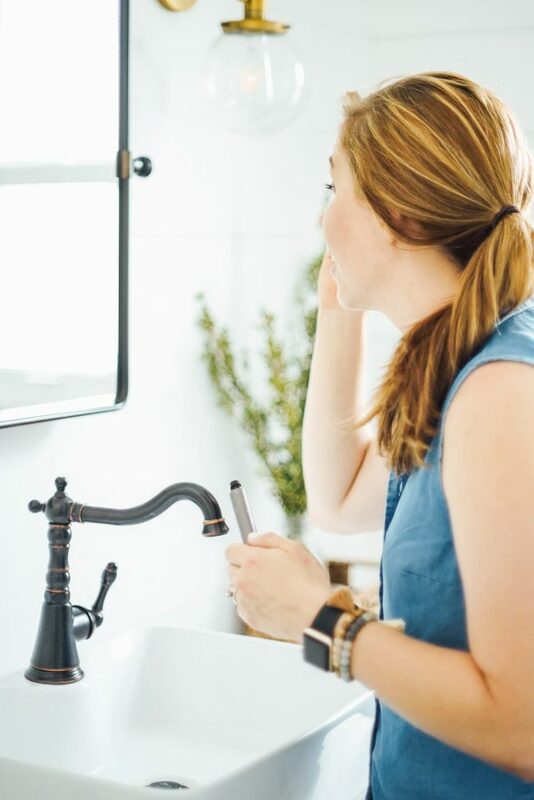 This means non-toxic skincare options are easier to find for the general public, making a more natural lifestyle easier to pursue for many people. 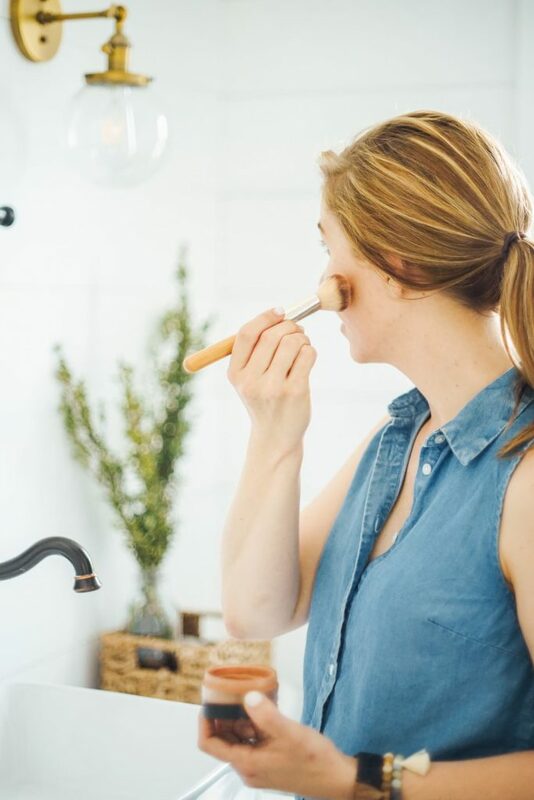 In a couple of weeks, I’m going to talk with Suzi from Gurl Gone Green about creating your own non-toxic makeup routine on the podcast. 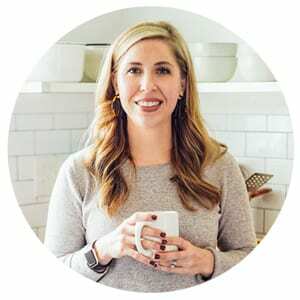 Suzi is an esthetician, mom, and beauty/skincare guru. 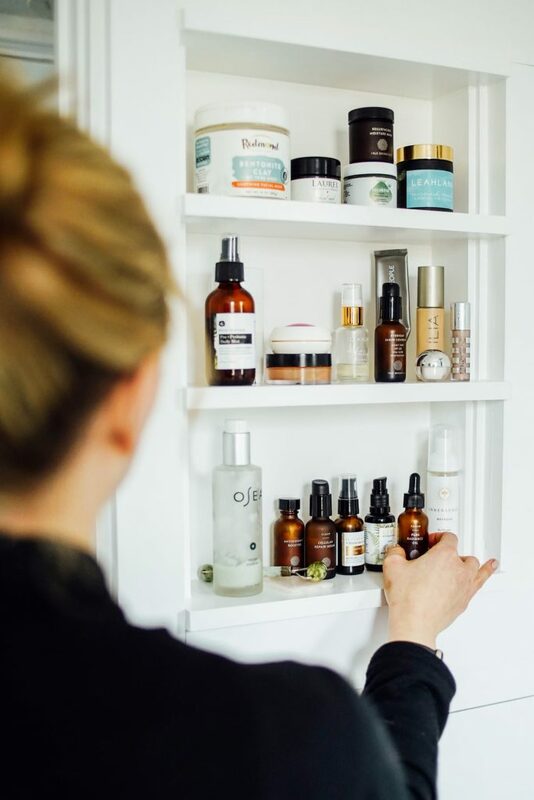 She will be sharing a ton of different makeup and skincare brands, along with tips and tricks for creating a natural skincare and makeup routine. Until then, here are the products that I’m currently loving and using. 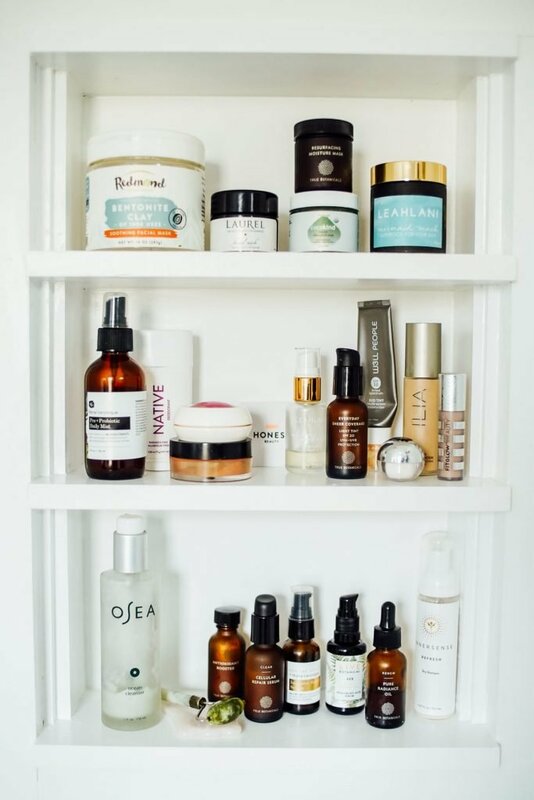 If you’re interested in seeing what my skincare routine currently looks like (along with my favorite skincare products), check out this routine post. I use a serum on face each morning before applying any makeup. I’ve found that a serum helps to moisturize my skin and allow makeup to go on smoothly. LeahLani makes my favorite serum products. I use the Ambrosia Elixir in the morning as a makeup primer. Yes, serums are an investment, but they last a while and the impact they’ve made on the appearance and feel of my skin are worth every penny. I use this moisturizer daily after using the serum from LeahLani. I even wear this moisturizer during workouts since it contains SPF. I love the lightweight formula and the excellent coverage. The coverage evens out my skin tone without feeling like I have foundation on my face. This moisturizer can go on very orange, so I stick with the lightest shade (Fair). Also, I’ve found that I need to rub the moisturizer between my fingers before applying to ensure even color coverage. For a special event, like during the holidays or for a date night, I’ll put on Ilia True Serum Foundation. This foundation is absolutely the best around for a full coverage foundation that not only evens skin tone but also nourishes the skin. This is available at Target, Amazon, and the Detox Market. This is my favorite concealer to date. It goes on smooth and light, without drawing attention to wrinkles or fine lines. It also doesn’t look “caked on” which I’ve found to be true with many concealers. 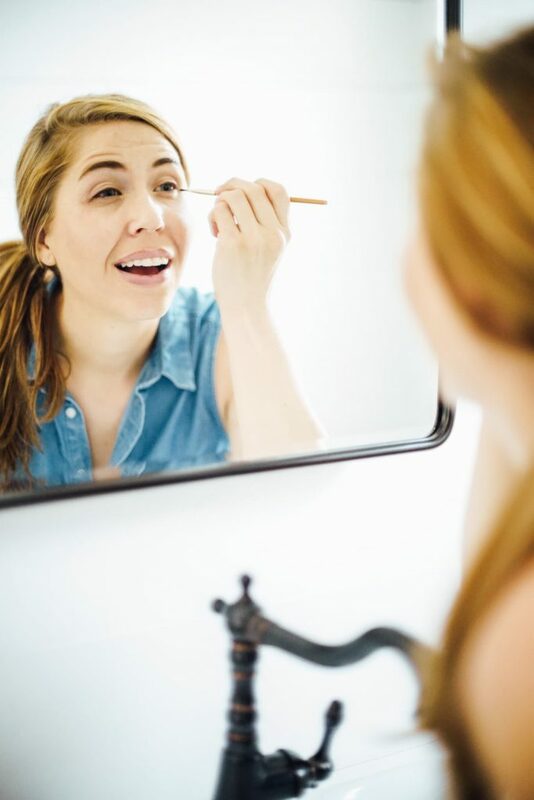 FitGlow makes awesome non-toxic makeup products that work so well. I mainly use this product for my eyes and for the unwanted breakout. Despite the lightweight feel, the cream-based concealer offers fantastic coverage. I use color C2. This is only available online. I purchase this product from FitGlow (online website), The Detox Market, or Amazon. After applying the W3LL People Bio Tint Moisturizer and Un-Cover Up, I go over my face with a light dusting of W3LL People Natural Bio Brightener Invisible Powder. This powder is invisible or translucent, so it just finishes off and locks in the tinted moisturizer and concealer. I’ve found that for a daily look this is all I need. I use a pressed powder brush to apply a small amount of this powder on my face. This is available at Target, Amazon, and online “health” retailers. If you’re looking for something with more coverage, my favorite powder is from FitGlow (Vita Set Powder). This powder is on the pricier side, but it lasts forever because a small amount provides fantastic coverage and gives such a wonderfully velvety look to the skin. This powder is available through Amazon Prime or the FitGlow website. 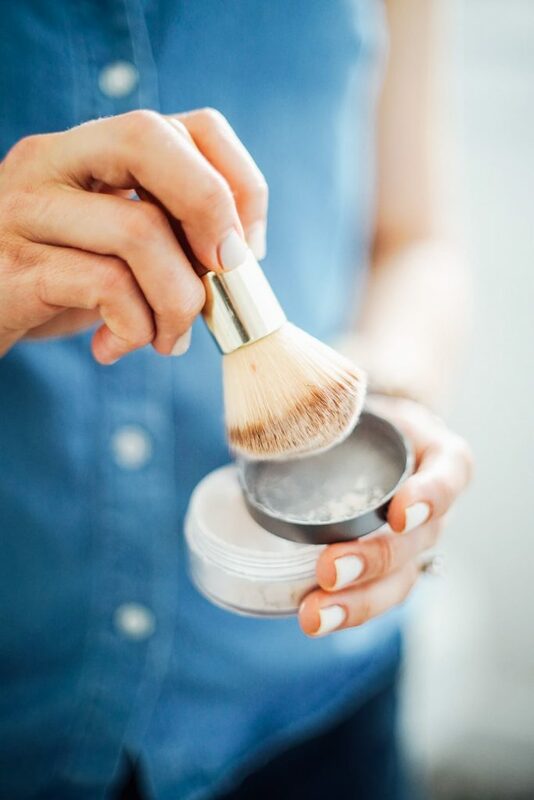 After using the invisible powder, I use a bronzer brush and the Crunchi Brilliant Bronzer to highlight my face: cheek bone area, along my nose, and at the very top of my forehead. This powder goes a long way, so it lasts forever. I’ve found the powder provides me with a just-right, sun-kissed glow or highlight. 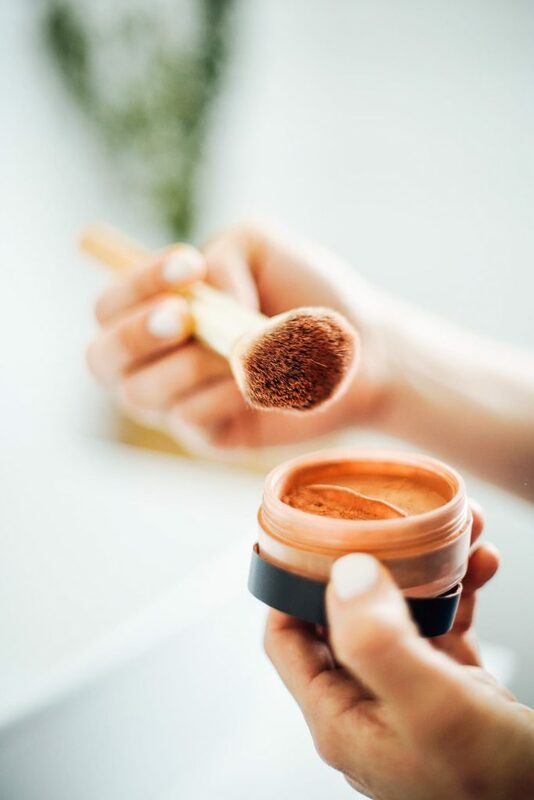 After applying the bronzer, I go back over it with my powder brush to blend, blend, blend. This is only available online, unless you have a store in your area that carries Crunchi. This is available through Target and Amazon. This is my favorite eyebrow filler to date. A little bit of this product goes a very long way, so the product lasts forever. This product is a wax, so it needs to be applied with a brush. I then use an eyebrow brush to make sure the wax is evenly distributed throughout my eyebrows for a soft, natural look. I use the Penelope shade, which is a dark brown color. Update: A few months ago, I decided to try Juice Beauty’s Brow Envy Gel. This product is so easy to use and super forgiving (if you don’t know how to do your eyebrows–like me). This is the product I’m currently using and will continue to use. The only con is the bottle is small and doesn’t last as long as the EcoBrow wax. Both products are fantastic, it just depends on your application preference. Pacifica is a brand that can be hit or miss as far as ingredients. I personally like their eye shadow palettes and lip gloss. And the fact that Pacifica is easy to find at Whole Foods, Target, and online is a huge plus. And their products are super affordable. 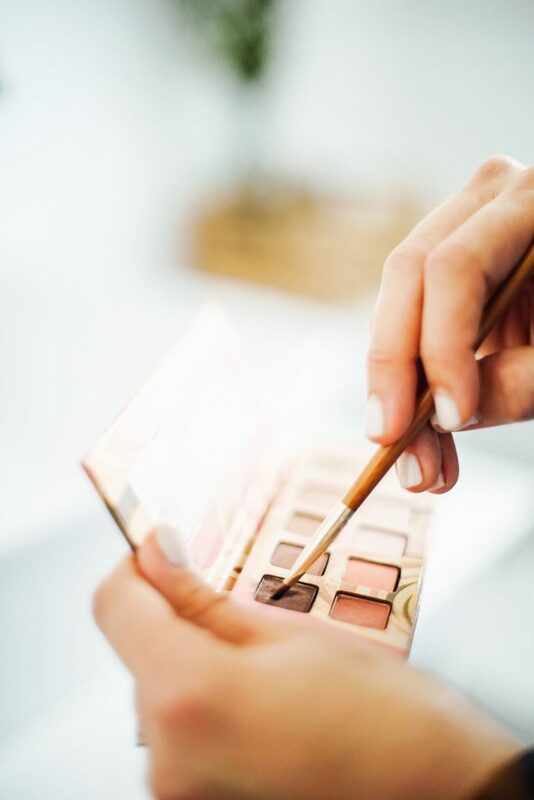 I use a small brush that’s been dampened with water with the dark brown in the Pink Nudes palette as eyeliner on my eyelid and also to provide some definition under my eye. I use the neutral colors in the palette for my actual eyeshadow, applied with a larger brush. This is available at Whole Foods, Amazon, and online “health” retailers. 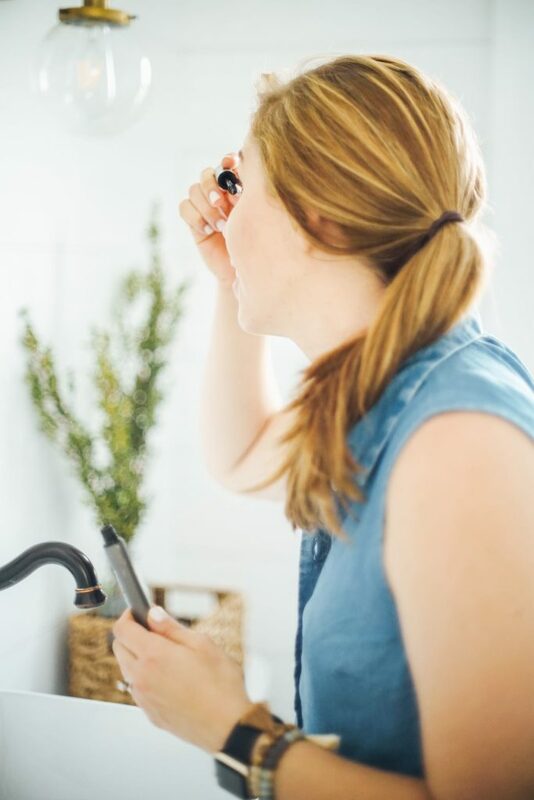 W3LL People makes my favorite non-toxic mascara. It just works so well! I would also like to try Honest Beauty Mascara, but it’s always out of stock at my local Target. <–It must be good stuff. I use an eyelash curler first, and then apply several coats of W3LL People Mascara to my lashes. Another favorite mascara is from Honest Beauty. This, again, is an easy-to-find and budget-friendly option that’s available through Amazon Prime and Target. I don’t wear lipstick on a daily basis, but I do have some on hand for date night and special events. Kosas makes the absolute best lipsticks, in my opinion. The colors are gorgeous and they actually stay on your lips. Plus, they don’t have a funky taste or smell. Kosas lipsticks are available through The Detox Market and the Kosas website. That’s it! That’s my almost-daily makeup routine. 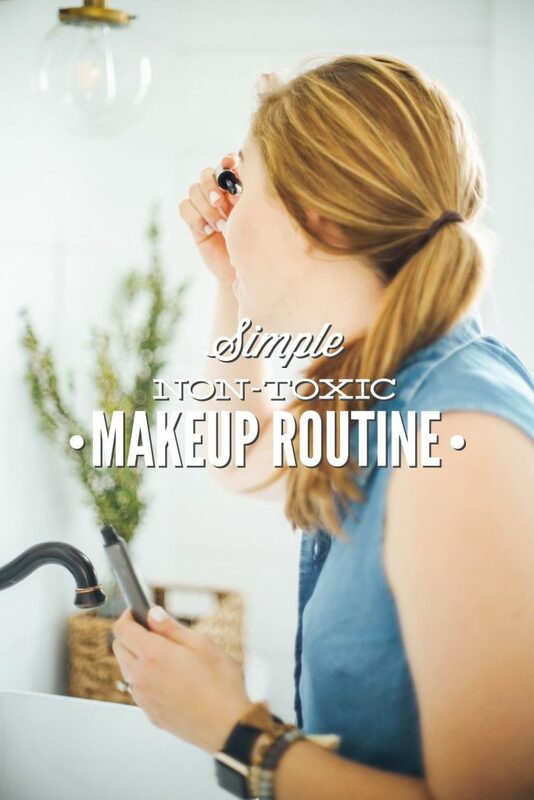 A routine that’s easy, simple, non-toxic and works for my lifestyle. I would love to hear from you. What does your makeup routine look like? What brands/products do you love using? 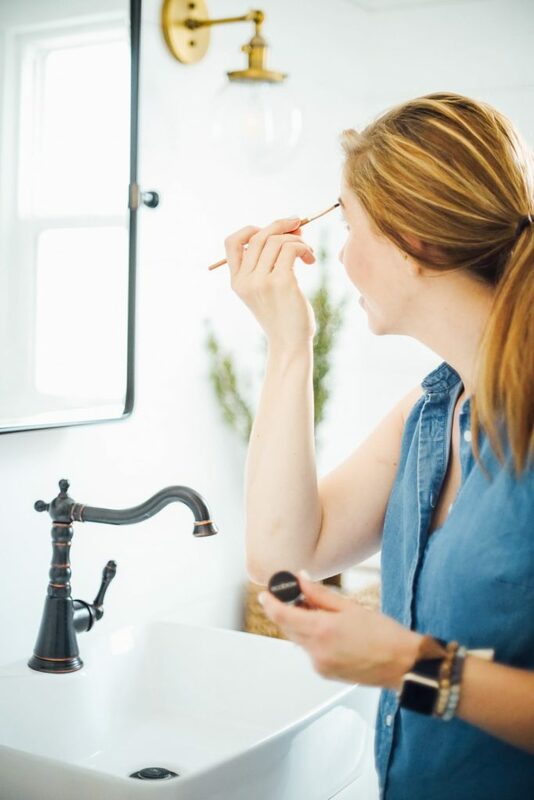 Thanks for sharing your makeup routine Kristin! I’m glad you try to stick to non-toxic lip products as much as possible. Many commercial lipsticks are full of harmful and allergenic ingredients. What’s particularly concerning is that many popular lipstick brands contain traces of lead! Some researchers say we shouldn’t be too worried, because they estimate we would need to ingest 1000s of lipsticks for the lead to harm us – but it’s concerning nonetheless! 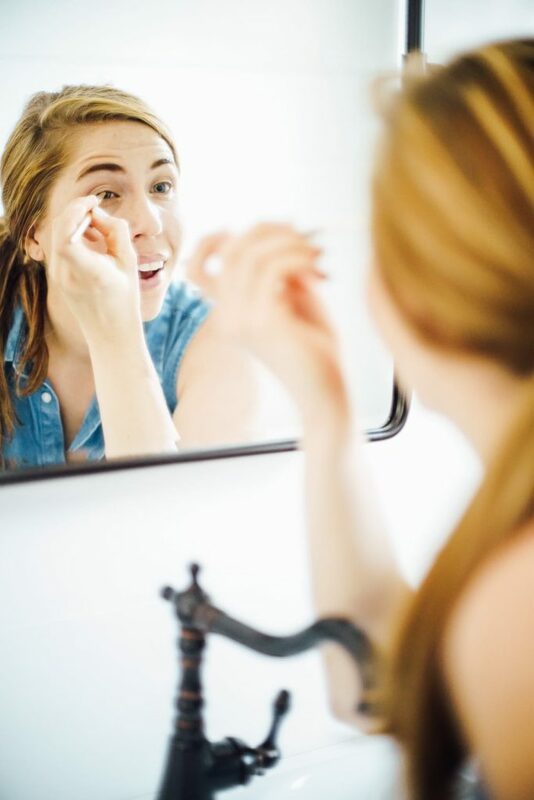 Thanks again for sharing your non-toxic makeup routine – love the pics!